IN THE small workshops of Purani Mandi in Saharanpur, woodcarvers fret, fit and polish their carvings for a revitalised urban market in India and abroad. Their own future, however, is precarious. Spiralling prices of fast-depleting raw materials and a market controlled by middlemen threaten to choke this once thriving trade. Paradoxically, even as the woodcarving industry shows signs of a revitalised export market, the carvers continue to depend on a system of contracts and sub-contracts that is crippling them. The trade, which originated as a sustainable profession, has become dependent on distant places for timber over the years. Until about 50 years ago, the local demand for sheesham (Dalbergia sissoo) was being met from the area itself or from the nearby Shivalik hills. But now it has to be brought in from other parts of Uttar Pradesh, mainly Tulsipur (Gonda), Padrauna, Deoria, Bahraich, Haldwani, Shahjahanpur and Hardoi (Figure 1). Some of it also comes from Bihar, Gujarat and Punjab. According to Ashok Chowdhury of Vikalp, a Saharanpur-based non-government organisation working primarily with rope-makers, "It is the forest department which is responsible for excess felling (of sheesham trees). Selling wood has become a business for forest officials." However, A N Chaturvedi, former UP principal chief conservator of forests and now with the Tata Energy Research Institute in Delhi, thinks otherwise. "Local people are responsible for the decline in sheesham and other species because they cut off the leaves for fodder. This prevents the further growth of the tree," he explains. Though no consensus can be reached, both views indicate that sheesham is being felled indiscriminately. No direct access Small-scale artisans are forced to approach middlemen because they have no access to sheesham wood. While a craftsperson employed in a work-shop does not have to buy wood himself, the independent artisan does. The price of sheesham today ranges from Rs 100 to Rs 400 per maund (approximately 40 kgs) depending on the girth, grain and sapwood content of the wood. The rise in the prices has been phenomenal, much ahead of inflation. The Uttar Pradesh Planning Institute has recorded a 475 per cent increase in prices between 1955 and 1980. Over the last 10 years, the prices have increased even further. However, there is no indication that the craftspersons have witnessed a corresponding rise in their income. Although sheesham is marketed mainly by the Uttar Pradesh Forest Development Corporation (UPFDC), the craftspersons cannot purchase it directly from them. Instead, it is auctioned in the open market without the benefit of the earlier 25 per cent state subsidy. So, a series of buying and selling takes place before the wood reaches the craftspersons. First, commissioning agents contact outstation timber contractors who are licensed to purchase timber from the forest department. The agents are able to buy wood by the truckload because they have storage facilities. This enables them to regulate the sheesham market in the area and forces the artisans to buy wood from them. For the smaller craftspersons, however, there is no such opportunity. They are outbid not only by middlemen and larger manufacturer-exporters, but also by those in the furniture industry who have now taken to sheesham due to the high prices of teak. The commissioning agents sell the wood to middlemen with a surcharge of 6 per cent on their purchasing price. The middlemen, in turn, charge upto 10 per cent extra on their purchase price. Thus, by the time the artisan purchases it from the middlemen, the wood could cost as much as 20 per cent more than its original price. The immediate problem is thus related more to purchasing power than to availability of wood. As Faroz Ahmed, a commissioning agent, said: "There is no shortage of supply. So long as you can give money, wood is available." The consequences of such pressures on wood artisans have been highlighted by Saurabh Sinha, in a study titled Sheesham Woodcraft Industry in Saharanpur. The study was commissioned by Oxfam (India) Trust. Sinha's data suggests that demand is outstripping supply. Figures from the Forest Statistics Bulletin of Uttar Pradesh (upto 1978-79) indicate that the potential growth of sheesham trees was 9,000 cu/m a year. However, the amount of wood used annually exceeded that, indicating that available resources might be dwindling. Increasing demand for sheesham wood has also resulted in trees being cut down much earlier than they used to be: once they would be cut after 55 years, now they are cut as young as 15 years. Oxfam had commissioned the study following complaints from abroad that the craft might be contributing to deforestation in the area. But Sinha found no conclusive data suggesting such a connection. On the other hand, he found that wood supplies had fallen, making sheesham prohibitively expensive for the artisans, and this was responsible for the trade's decline. He emphasised that unless efforts are made to improve the artisans' lot, the craft will not survive. The picture in Purani Mandi substantiates Sinha's findings. Much of the artistic qualities and craftspersonship associated with Saharanpur's woodcarving are slowly disappearing under the pressures of the export market. The artisans' total dependence on middlemen aggravates the situation. As Mehmood Hussain Ansari, a carpenter and finisher, says: "I take loans for everything -- to buy wood, to buy oil, to buy food. That is because the cost of living is so high and the returns from our trade so little." The artisans have had to adapt widely to sustain their trade. 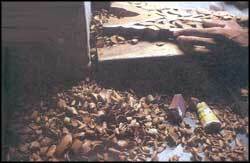 Often, they buy sheesham of inferior quality and use small chips of wood that they would have discarded earlier. Though this does not necessarily result in poor quality work, according to Mehmood Ansari, "the margin for error is much less". Undue emphasis is also laid on polishing and finishing the products to mask defects. Significant changes have occurred in the product line, too. Smaller objects, like pen-holders, card-boxes and bangles, which maximise the use of wood are now produced in large quantities. A close look at the designs reveals that intricate floral motifs, like the climber leaf or the creeper, that had characterised the trade, are now replaced by simple designs, featuring flowers and hearts. In his workshop at Lakhi Gate II of Purani Mandi, Ansari busily carves pen-holders, chess sets and card-boxes. Most of his finished products he will sell cheap either to big manufacturer-exporters or to public sector concerns like the Central Cottage Industry Corporation. A few shops away, Ustad Ghulam Mohammad, 87, who has been in the trade for over 70 years, says, "I am increasingly unable to make ends meet. Small artisans like me are dependent on others to buy wood and to sell our products." Saharanpur artisans have also resorted to cheaper varieties of wood like haldu (Adina cordifolia), kail (Pinus wallichiana), mango (Mangifera indica), sagon (Tectona grandis) and tun (Toona ciliata). But these substitutes lack the two qualities that make sheesham ideal for woodcarving: durability and adaptability. Sinha notes that haldu, the most common substitute, is a dense wood and more difficult to carve. Kail gives a poor finish, while mango has a high moisture content and, therefore, is more susceptible to damage during seasoning. Nevertheless, these alternative woods might also become more expensive in the future as demand grows, he adds. Another factor hiking sheesham prices is that the wood is being increasingly used by the furniture and construction industries which have been hit badly by dwindling stocks of teak and because sheesham products bring in higher profits. Sinha says that as much as 50 per cent of sheesham from Saharanpur is sent to furniture-makers in Karnal, Panipat and Rohtak in Haryana, and Shamli, Kankhal, Jwalapur and Dehradun in UP, and to Bombay and Delhi, where the construction industry is most active. The woodcarving industry in Saharanpur has grown rapidly since Independence as a result of a full-fledged strategy to promote it. Public sector cooperatives provided institutional support to the industry in terms of production and marketing. Boom-time came round in 1980-81. Exports touched nearly Rs 6 crore and then crashed to Rs 3 crore in 1988 before picking up again and topping Rs 11 crore in 1991. However, the growth in exports has not benefited the craftspersons. An All India Handicrafts Board report noted as much in 1978-79 when it stated: "Commensurate benefits have not been flowing to the craftspersons.... there are instances of gross underpayment of wages, unfair deductions and unwarranted rejections of the products offered by workers. While the bulk of the marketing is in the hands of the middlemen even public sector organisations have not set high standards of treatment." Little seems to have changed since then. Even today, most workshops are small and function without any support from public sector organisations. In Ansari's words, "These organisations do nothing for the workers. Only the big manufacturer-exporters benefit from their services." As the small-scale artisan is not in the formal industrial sector, he is outside the purview of the public sector institutions. Artisans must have their units registered at the district industry centre (DIC) in Saharanpur to obtain any institutional assistance. What assistance the artisans can get is unclear. According to an official of the directorate of handicrafts, DIC marketing and extension services usually benefit the major manufacturer-exporters, who already have a marketing infrastructure of their own. For small artisans, getting assistance is cumbersome. Any financial assistance sought involves a two-day administrative procedure, which means two precious days away from his workshop for the artisan who, therefore, continues to depend on subcontracts for his livelihood. As a result, the skilled artisans of Purani Mandi are migrating from Saharanpur to places like Delhi, Bombay, Hyderabad, Lucknow or even the Gulf countries and switching to other forms of employment. More often than not, they continue to work with wood, but as general-purpose carpenters. Unskilled artisans, on the other hand, become rickshaw-pullers or manual labourers. The net result has been a sharp fall in the numbers of woodcarvers. To reverse this cycle, suggests Sinha, the government should introduce a 10 per cent surcharge on the freight-on-board prices of products. This, he argues, will generate enough revenue for a massive sheesham afforestation programme. But Sinha feels it is simultaneously necessary to guarantee that the sheesham supply is targeted at the artisan community. The primary aim, he adds, should be to make the market accessible to artisans. A centralised system is necessary to provide sheesham and marketing services to artisans at low costs. Something must be done to stop the exploitation of carpenters.